"Any Belgian Station" tickets permit you to travel by Eurostar from London to Brussels and then on to any Belgian station, all on the same ticket. Simply search for trains from London to any station in Belgium and you'll be shown a recommended route. Your ticket includes a Eurostar from London to Brussels-Midi, on which you'll have a specified seat. Once you arrive in Brussels you can travel on any train (except high-speed ICE or Thalys) without a prior seat reservation (it will show "Unreserved seating" in your basket). We display a recommended train within Belgium to help you plan your trip. However, the ticket is valid from Brussels to your destination at any time within 24 hours of alighting from Eurostar, or within 24 hours before your return Eurostar to the UK. Your ticket will show "Any Belgian Station" as the destination - not the station which you specified in your search. This means that those with a return ticket to "Any Belgian Station" are free to travel out to one station and back from another. Note that you can't use these tickets on Thalys or on Deutsche Bahn ICE trains. All other trains are fine. All Eurostar tickets to Brussels-Midi include free onward travel to other railway stations in central Brussels, including Bruxelles-Central (the most convenient station for the city centre), Kapellekerk, Brussels Nord, Congrès and Brussels Luxembourg (in the European Parliament complex). So there's no need to pay extra to buy an Any Belgian Station ticket if your destination is within Brussels. If your final destination is within Greater Brussels (i.e. 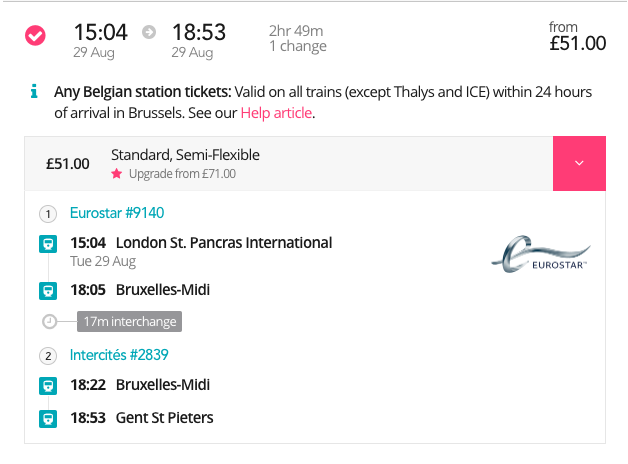 not the city centre), you may find it cheaper to buy a regular Eurostar ticket to Brussels and an onward ticket upon arrival at Brussels-Midi. You might find CityMapper useful to plan this part of your trip, since urban transport (e.g. Metro or bus) might be more practical for the final leg.